It was already around 11pm when I was heading home after taking all these photos of Shinjuku from the previous post. 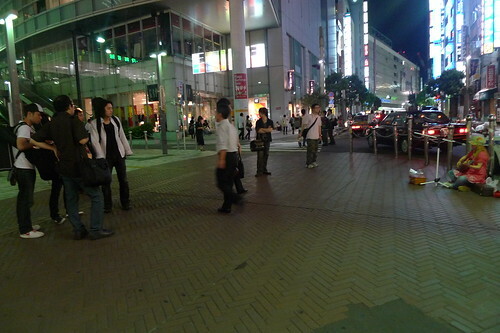 But as I walked out of the Shinjuku South East exit, I found a young woman sitting on the floor, preparing to perform. A scattered few were gathered before her. She was the one and only musician I saw last night. 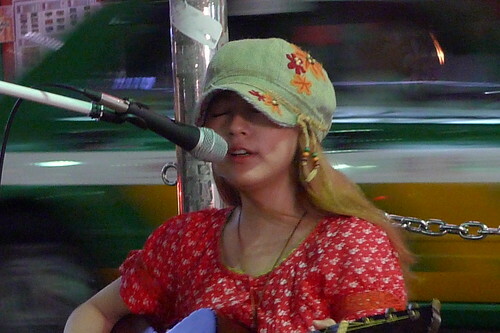 I would later find out that her name is Mutsumi (clicking her name will bring you to her blog, but Japanese only, she did write about this particular live performance in this blog post). 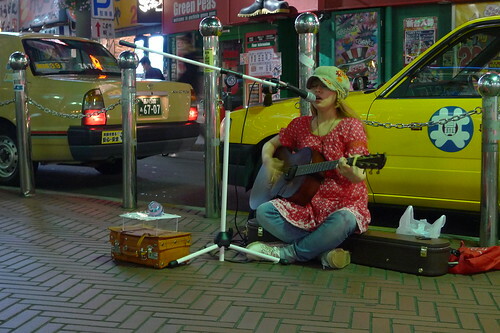 A sample of her song can be listened here. Yeah, I didn't manage to take a clear photo of her, so here are some from her blog. A group of musicians (far left in photo) also appeared to watch. Here's one of her songs in its entirety. I later approached her, thanked her for her performance and told her I was a filmmaker, then I said that maybe we should do a music video together (yes, all I actually harbour dreams of making a music video) I probably didn't seem credible enough though, haha.